This year, don’t just count the days of the Omer – make the days count! Sefiros takes you on a seven-week journey of spiritual refinement and improvement, providing you with practical techniques to maximize the growth potential inherent in each of the forty-nine days of Sefirah. In this version, read all forty-nine days of growth. Download Sefiros Grow today! Brought to you by Rabbi Haber, this app gives you a pleasant and intuitive way to count the Omer and make your day more meaningful. 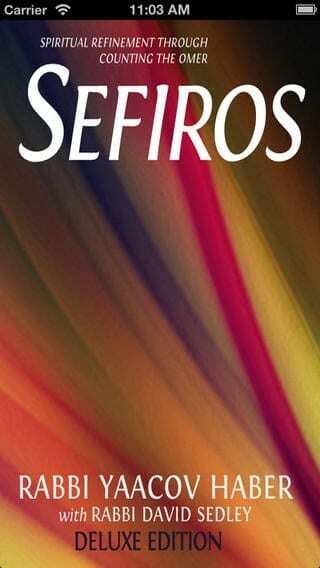 Sefiros Grow brings you an entire Sefiros book combined with action alerts from the book that enhance your day with spiritual insights into your daily life. With a Sefirah reminder built into the app, using your device’s GPS to calculate time to count the Omer, there’ll be no more forgetting to count the Omer! This app lets you share your status updates with friends on Facebook and Twitter.